North Africa or Barbary IV Tripoli. This is a scarce and beautiful 1837 Society for the Diffusion of Useful Knowledge or S.D.U.K. 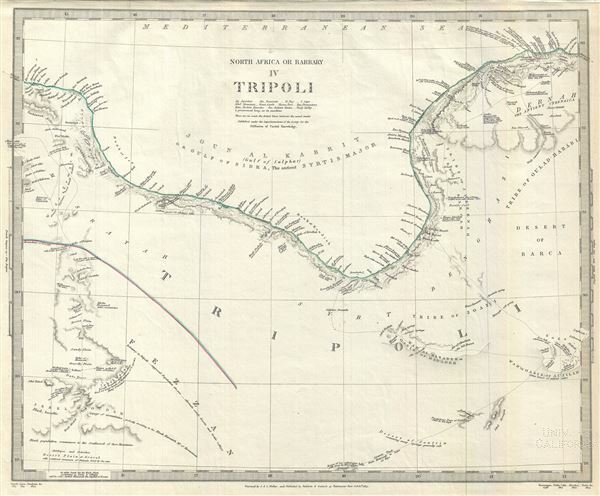 map of Tripoli (part of modern day Libya) on the Barbary Coast in northern Africa. It covers the regions of Tripoli, including parts of the modern day districts of Sirte, Misrata, Murqub, Al Wahat and Bengazi. Various towns, cities, deserts, oases, mountain ranges, rivers and several other topographical details are noted with relief shown by hachure. Throughout the map includes several annotations regarding the topography and geographical features. Several indigenous African tribes are also identified. The map also identifies the inland oasis Kingdom of Fezzan. Though mostly desert, 19th century Fezzan had numerous oases and supported a relatively large population. This desert kingdom was a critical stopping point for trade caravans crossing the Sahara since antiquity. This important still active caravan route, with its string of Oases, is mapped out in some detail. Parts of North Africa, at the time were under the influence of the rapidly declining Ottoman Empire. The region would go on to be colonized by France, United Kingdom, Spain and Italy during the next century. This map was originally published by Baldwin and Cradock and copyrighted in 1837, but was issued in Volume two of Chapman and Hall's 1844 edition of Maps of the Society for the Diffusion of Useful Knowledge. It was engraved by John Walker of J. and C. Walker. Rumsey 0890.115. Phillips (Atlases) 794.